In the latest from the bestselling author of Plagued by Quilt, Kath Rutledge yarn bombs Blue Plum, Tennessee -- and gets tangled up in the mystery of a bumped-off bagpiper. It's time for Handmade Blue Plum, an annual arts and crafts fair, and Kath and her knitting group TGIF (Thank Goodness It's Fiber) plan to kick off the festivities with a yarn bombing. But they're not the only ones needling Blue Plum. Bagpiper and former resident Hugh McPhee had just returned after a long absence, yet his reception is anything but cozy. The morning after his arrival, he's found dead in full piper's regalia. 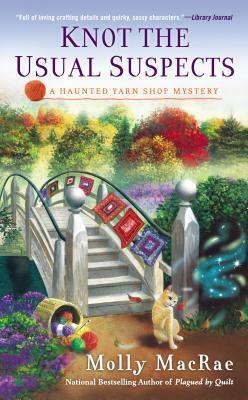 Although shaken, Kath and her knitting group go forward with their yarn installation -- only to hit a deadly snag. Now, with the help of Geneva, the ghost who haunts her shop, Kath and TGIF need to unravel the mystery before someone else gets kilt!